Having binge watched all of “House of Cards” as a reward for writing and submitting an essay, having finally finished “Dexter” and having completely lost interest in “Breaking Bad” I found myself searching for something new for me to focus my (decidedly short) attention on. Cue the introduction of “The Unbreakable Kimmy Schmidt” into my life. A persistent, impossible to ignore Netflix advert caught my eye, and as each episode clocks in at just less than 25 minutes, it seemed like the ideal show for someone with the attention span of a three year old to start watching. I will admit that I was wary at first, as I’ve never been a fan of over-the-top comedy (Miranda excluded, it’s a classic) the storyline was one that immediately appealed to me. 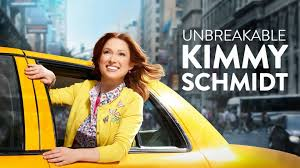 The story focuses around quirky Kimmy Schmidt, a twenty-something year old who was kidnapped with three other women and kept in an underground bunker for fifteen years of their lives. Upon their rescue from the bunker, the story follows Kimmy as she decides to stay in New York instead of going back to Indiana where she came from, and her trials and tribulations as she gets use to living in the “Big City”. The show features a raft of truly lovable and memorable characters, including Kimmy’s fabulous gay, black housemate Titus, played by the wonderful Tituss Burgess, whose dream is to become a Broadway actor (there is an excellent scene in the first episode where he puts on a one man performance on the Lion King, featuring a disgruntled ginger cat) and her kooky landlady Vera, played by Susanna Guzman (of Confessions of a Teenage Drama Queen fame) as well as the decidedly upper class woman, Jacqueline, who employs Kimmy to be her housekeeper of sorts. The show was created and produced by Tina Fey, which naturally means it will be hilarious from the offset, and she appears later in the series as a clueless lawyer, which garners truly laughter inspiring results. It also features a deeply catchy soundtrack, which is introduced to us as a “remix” of a news story at the very beginning of the first episode.